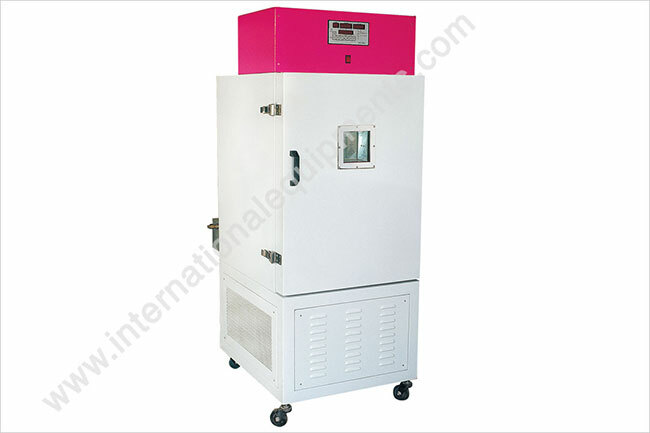 To determine the effect of relative humidity on sample at various temperatures. Computerised Humidity chamber to determine the effect of relative humidity on sample at various temperatures. • Humidity range : 20% RH to 95% RH. • Compressor : CFC free. • Direct display and printout through microcontroller : Set RH, Actual RH, Set temperature and Actual temperature. • Graphic display and printout through PC: In addition to the above values, % RH and Temperature Vs Time graph could be	obtained by attaching a printer to the PC. • Power : 230 Volts, 50 Hz, Single phase.